The fruit of the Delaware native pawpaw tree. DNREC photo. WILMINGTON – The Blue Ball Barn at Alapocas Run State Park will host its fifth annual Pawpaw Folk Festival from 10 a.m. to 3 p.m. on Saturday, Aug. 20. Admission to the festival is free with paid park admission. The festival is a family-friendly day filled with fun activities. The star of the festival is one of Delaware’s native trees, the pawpaw. Alapocas Run State Park has the perfect habitat for the tree, which is the only food source for the caterpillars of a native butterfly, the zebra swallowtail. Festival activities include storytelling, folk art vendors and demonstrations, guided hikes, live music and a special guest lecture with Ron Powell from the North American Pawpaw Growers Association. WiLDWiCH Gourmet Sandwiches, UDairy Creamery and Papa Smurfs BBQ will have food available for purchase. 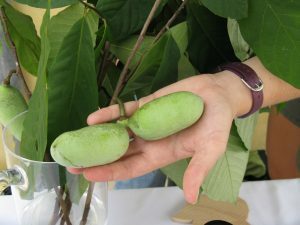 Visitors will also have the opportunity to taste pawpaw fruit. This event is made possible by support of Delaware State Parks, Friends of Wilmington Parks, the Delaware Humanities Forum, Delaware Division of the Arts, Delaware Solid Waste Authority and WDSD 94.7 FM. Alapocas Run State Park in Wilmington features a multi-use trail that connects to the Northern Delaware Greenway, the Can-Do Playground and the historic the Blue Ball Barn. The Blue Ball Barn, 1914 West Park Drive, Wilmington, DE was built in 1914 by Alfred I. DuPont. The barn is named after the Blue Ball Tavern, an inn and meeting house that was once located near the property. The Blue Ball Barn is now the home of the Delaware Folk Art Collection, which reflects local cultures of Delaware. The facility is available to rent for meetings, conferences, formal functions, casual luncheons and more. Additional information about Alapocas Run, Blue Ball Barn, Wilmington State Park programs and programs throughout Delaware State Parks is available at destateparks.com. Contact: Elizabeth Androskaut, Interpretive Programs Manager; or Elizabeth Drummond, Alapocas Run and Wilmington State Parks, 302-577-7020.